President-elect Donald Trump not only alleged widespread national voter fraud in a series of messages posted on Twitter on Sunday, but took the time in one tweet to target the ballots cast in California as an example of the problem. Trump called the fraud “serious” in the state, along with Virginia and New Hampshire, and blamed media “bias” for the lack of coverage the allegations have received. It was the first time the president-elect has specifically voiced concerns about voting in California. The tweet came in the wake of several days of criticism from both Trump and his advisors over an effort by the Green Party to force a recount of votes cast in Wisconsin and possibly Michigan and Pennsylvania. "It appears that Mr. Trump is troubled by the fact that a growing majority of Americans did not vote for him. His unsubstantiated allegations of voter fraud in California and elsewhere are absurd. His reckless tweets are inappropriate and unbecoming of a President-elect." Might there be random cases of improper voting in California and elsewhere? Yes, and when the authorities discover them, they should investigate. But it makes no sense to suggest massive fraud in California. First, there is no evidence for the claim. Second, it would not even make sense to commit such fraud. Before the election, Clinton was on track to win the state by a huge margin. Why on earth would anyone risk a felony prosecution to pad her margin in a state that she was going to carry anyway? Look past the GOP takeover of Washington, however, and the outlook for Democrats is even more alarming. In November, the party lost control of state legislatures in Iowa, Minnesota, and Kentucky. The state senate in Connecticut, which had been firmly blue, is now evenly split. Republicans ousted Democratic governors in Missouri, New Hampshire, and Vermont. All told, Democrats surrendered about 30 seats in state legislatures. They now hold majorities in just 31 of the country’s 98 legislative bodies, and only 15 of the nation’s governors are Democrats. The losses in November are part of a sharp and unprecedented decline for the party at the state level. Since Obama took office eight years ago, Democrats have lost over 800 seats in state legislatures. For the first time in history, they do not control a single legislative chamber in the South. Overall, the party is now at its weakest point at the state level since 1920. The GOP takeover of state governments was no accident. In 2010, Republicans poured $30 million into state races—three times more than Democrats— as part of a deliberate strategy to control the once-in-a-decade process of congressional redistricting. As a result, Republicans picked up 675 legislative seats and gained control of twelve state legislatures. In 2014, the GOP spent another $38 million on state races and picked up ten more legislatures. Republicans have been deliberately building their advantage at the state level since 1994, when they took control of 15 state legislatures. Groups like the corporate-backed American Legislative Exchange Council and the State Policy Network began using state legislatures as laboratories for conservative ideas, funneling policy proposals from Newt Gingrich’s “Contract with America” to state lawmakers. With their first majority in Congress in 40 years, Republicans in Washington could also dictate public policy in a host of states: For the first time in history, as conservative Democrats defected to the GOP, more than half of Southern legislatures tilted red. After the Civil War, federal troops occupied the defeated South and helped enforce civil rights laws, enabling Republicans to win power in many Southern states thanks to the overwhelming votes of newly enfranchised black men. While they controlled many former rebel states during Reconstruction, other Southern states like Kentucky that hadn’t seceded stubbornly resisted the Republican Party. After Reconstruction ended and those troops withdrew, white-supremacist reactionary Democrats retook power in nearly every Southern state, and even the modern pro-civil rights party held every Southern state legislative chamber as recently as 1992. While the two parties’ voter coalitions and their positions on civil rights have changed massively in the last century and a half, one thing remained constant: Republicans had never held every Southern legislature at once. That streak ended in 2016, when Republicans won control over the Kentucky state House for the first election since 1920, giving them control of both chambers at once there for the first time in state history. Democrats had lost power in Kentucky during part of the Civil War, when pro-Confederate forces tried to form a rival secessionist government, but it was to the Unionists instead of the Republicans. With Kentucky, Republicans now control both legislative chambers in every Southern state, roughly those that span from the Virginias to Texas. Although the Census Bureau still defines the Democratic-controlled ex-slave states of Delaware and Maryland as Southern, their cultural affinities have drifted much closer to the Northeast in the post-World War II era. Donald Trump won all of these Southern states except Virginia, while Republicans have also aggressively gerrymandered the vast majority of their state legislatures. However, Kentucky’s lower chamber was a rare Democratic-drawn map, helping the party cling to power until 2016. Bill Clinton was the last Democratic nominee to demonstrate wide appeal across that divide: In both 1992 and 1996, he carried nearly half of America’s 3,100 counties. But since then, Democrats have retreated into the nation’s urban centers. In 2000, Al Gore narrowly won the popular vote, but carried fewer than 700 counties. In 2012, President Obama squeezed even more advantage from the biggest places: He carried 86 of the nation’s 100 largest counties (including the District of Columbia), winning them by nearly 12 million votes combined. That allowed him to win comfortably, although he carried only about 600 of the remaining 3,000 counties, and lost them by nearly 7 million votes combined. This year, Hillary Clinton pushed that model just past the breaking point. Pending final results, she now leads in 88 of the nation’s 100 largest counties (including D.C.). Suffering a slight decline in African American support, Clinton did not quite match Obama’s vote margins in some crucial metropolitan areas, particularly Detroit, Milwaukee, and Philadelphia. But overall, she delivered a dominant performance in most urban centers and many affluent white-collar suburbs. She held Trump to less than one-fourth of the vote in such mega-counties as Manhattan, Cook (Chicago), and Los Angeles; expanded on Obama’s margins in growing Sunbelt cities such as Miami, Charlotte, and Houston; and utterly routed Trump in thriving new economy centers like Austin, Silicon Valley, and Seattle. At latest tally, Clinton won the nation’s 100 largest counties by fully 12.6 million votes—an historic lead certain to widen with many more West Coast ballots yet to count. It’s common to view their concerns through a purely economic lens and call them protectionist. That is largely true as far as it goes: These people have been buffeted by globalization more than most Americans and see restrictions on trade and immigration as ways to boost the number of good-paying jobs open to American workers. But that’s far from all that they want, nor does a purely economic lens capture the way they view their votes. They are best viewed through the lens of active citizenship. They take national identity seriously and imbue Americanism with an implicit bargain that flies in the face of liberal or libertarian cosmopolitanism. They believe that being American means more than voting and paying taxes. To them it means that if you work hard and play by the rules, the people who run the country owe it to you that you will live with dignity and respect. I’m sure many people reading this are thinking, “Adding these voters to the conservative coalition can’t be done.” But in fact it can be done, as Wisconsin governor Scott Walker showed. Walker cut taxes and reduced the rate of spending growth while taking on public-employee labor unions. He also expanded government-funded health-insurance coverage by taking advantage of his state’s very generous Medicaid program to cover more poor people publicly and push working-class people into Obamacare’s exchanges. All factions in his coalition got something they valued. Walker rode this balanced approach to two important political victories, winning a recall battle and then reelection despite being targeted by national progressive groups. In his three elections, Walker won virtually all of the historically Democratic white counties that Trump won, often running only a couple of percentage points behind Walker. Trump Democrats could also be called Walker Democrats. Walker’s subsequent political missteps also show how one can lose these voters’ support by becoming too conventional a Republican. Walker veered to the right as he prepared his presidential campaign, catering to tea-party and Christian-conservative groups in nationally covered speeches in Iowa. He also tried to reduce funding for the University of Wisconsin system. His approval ratings dropped sharply and remain mired around 42 percent. I took a list of all 981 U.S. counties1 with 50,000 or more people2 and sorted it by the share of the population3 that had completed at least a four-year college degree. Hillary Clinton improved on President Obama’s 2012 performance in 48 of the country’s 50 most-well-educated counties. And on average, she improved on Obama’s margin of victory in these countries by almost 9 percentage points, even though Obama had done pretty well in them to begin with. These results are every bit as striking: Clinton lost ground relative to Obama in 47 of the 50 counties — she did an average of 11 percentage points worse, in fact. These are really the places that won Donald Trump the presidency, especially given that a fair number of them are in swing states such as Ohio and North Carolina. He improved on Mitt Romney’s margin by more than 30 points (!) in Ashtabula County, Ohio, for example, an industrial countyalong Lake Erie that hadn’t voted Republican since 1984. In short, it appears as though educational levels are the critical factor in predicting shifts in the vote between 2012 and 2016. You can come to that conclusion with a relatively simple analysis, like the one I’ve conducted above, or by using fancier methods. In a regression analysis at the county level, for instance, lower-income counties were no more likely to shift to Trump once you control for education levels.11 And although there’s more work to be done, these conclusions also appear to hold if you examine the data at a more granular level, like by precinct or among individual voters in panel surveys. By the time Richard B. Spencer, the leading ideologue of the alt-right movement and the final speaker of the night, rose to address a gathering of his followers on Saturday, the crowd was restless. Spencer was perhaps more unsparing in his criticism of conservatives than of the left, cracking disparaging jokes about the “freedom fries” of the George W. Bush era and railing against the “neocons” who push, in his view, overly muscular foreign policy proposals. He said he would strongly oppose the appointment of the hawkish former U.N. Ambassador John Bolton to a potential Trump administration cabinet position, like secretary of state, and he blasted a Bush-inspired, interventionist-oriented foreign policy. One reason for Clinton's defeat was intense opposition from rural voters. Another was revulsion against Washington insiders So for 2020, Democrats might look to a governor with a track record of winning rural voters. Only two of these states will have Democratic governors as of next year. Jim Justice won the West Virginia governorship this year. He has never held any other office, and until last year, he was a registered Republican. Democrats probably would not find him acceptable: he is a coal billionaire who owes millions in back taxes and mine safety fines. That leaves Steve Bullock of Montana, who won this year even as Trump racked up a 20-point margin in the state. His moderately progressive stands would be attractive to a general electorate and his advocacy of campaign finance reform could be very appealing to many Democrats. He is relatively young (born 1966), well-educated (Claremont McKenna College -- where he was my thesis student! -- and Columbia Law), and experienced (he is in his second term, with four years as state attorney general before that). Reid Wilson reports at The Hill that Democrats have hit a new low in state legislative seats. Republicans will control 4,170 state legislative seats after last week’s elections, while Democrats will control 3,129 seats in the nation’s 98 partisan legislative chambers. Republicans picked up a net gain of 46 seats in Tuesday’s elections, while Democrats lost 46 seats, according to the latest vote counts from The Associated Press. Independents and members of minor parties hold 71 seats, including the entire Nebraska Senate, which is nonpartisan. Nearly two weeks after Election Day, about a dozen seats remain too close to call. The results cement a dubious legacy of Republican gains in state legislatures during President Obama’s tenure. Republicans gained more than 700 seats in the 2010 midterm elections and nearly 300 in the 2014 midterms as Obama’s approval ratings suffered. Democrats clawed back more than 100 seats in 2012, when Obama won reelection. In total, Republicans control nearly 1,000 more legislative seats than they did when Obama took office. The Republican share of state legislative seats has grown from just under 44 percent in 2009 to 56 percent after Tuesday’s election. This problem will plague Democrats in years to come, as it depletes their roster of candidates for other offices. Compare and contrast with earlier years. In 2014, we put together an index to measure the electoral strength of the parties. Rather than focusing on the presidency, we broke partisan control into five categories: presidential, Senate, House, governorships, and state legislatures. We have updated our index using the mostly complete data for the 2016 elections and can conclude that the GOP is in the strongest position it has been since 1928. In many sub-categories, it is near an all-time high. The party that holds the presidency almost always loses strength, but the magnitude of that loss and how quickly it occurs is effectively random. Democrats should not be too discouraged by their present state of affairs. History teaches that it can be reversed, and rather quickly. The NRSC’s strategy of spending its money early meant the party was being vastly outspent by its Democratic counterpart late. The NRSC had spent $31 million between August and September, while the DSCC spent just $13 million. But beginning in October, the NRSC had reserved just $10 million in late airtime — while the DSCC had reserved $44 million in ads. The NRSC took out a $15 million line of credit for last-minute spending, but its hope was that outside groups would fill in the rest. “The disparity between the two committees is unlike anything I’ve seen since I started doing this,” said one longtime GOP official. McConnell took the lead in warning donors about what was to come. Though he could not directly solicit contributions for the Senate Leadership Fund, run by his former chief of staff, Steven Law, McConnell sent signals, Law said, that the GOP’s leading outside group needed late cash. Last-minute donations gave the group the ability to dump more than $35 million into advertising in crucial states. All told, the Senate Leadership Fund (SLF) and One Nation raised and spent $165 million on behalf of Senate Republicans. Of that, the SLF spent almost $38 million on television spots in just the last 14 days of the race. On the presidential campaign trail, Rubio had trashed Washington. But the Rubio who returned to the Senate was not that Rubio. He threw himself into legislating with new vigor, especially as he sought funding to fight the outbreak of the Zika virus, which hit his state hard. McConnell noticed his young colleague on the floor more often, and he suspected all the talk about hating the Senate had been a facade for Republican primary voters. McConnell asked Rubio to reconsider his decision not to seek reelection. When Rubio didn’t show up for one of the Senate Republican Conference’s weekly lunches, McConnell told his fellow senators to seek him out and urge him to run again. Ward Baker, the executive director of the National Republican Senatorial Committee (NRSC), organized a parade of phone calls from friends and supporters back in Florida pushing Rubio to get back in the race. By Memorial Day, Rubio had all but decided to enter the field. He made it official in June, citing the devastating mass shooting at an Orlando nightclub. Sen. Rob Portman’s (R) campaign had focused on the number of jobs Ohio lost during Strickland’s tenure in office, a term that overlapped with the 2008 recession. Those attacks sent Strickland’s favorable ratings plunging 10 points between March and June, and his unfavorable ratings soared even more than that. Before Labor Day, Republicans had spent an incredible $35 million making the case against Strickland. Portman’s advantage: “The flip side of being a longtime D.C. insider is a mountain of money,” a top Democratic strategist lamented. Indiana was not what Democrats hoped. Bayh began to look like a candidate whose time had passed, like Tommy Thompson or George Allen before him. He had been a great candidate when he ran in 1998 and 2004; by 2016, he lamented to the Indianapolis Star, politics had changed — and, he may have implied, left him behind. At The Hill, Reid Wilson reports that the Senate GOP leadership and NRSC worked hard to save their party's majority. They took early action to deter primary challenges. From the beginning, [Ward] Baker, the hard-charging and brashly blunt retired Marine who ran the NRSC, pushed his candidates to insulate themselves from a national tide. After studying Senate races from 2012 and 2014, Baker and his team came to two conclusions: First, that candidates with strong favorable and job approval numbers tended to survive waves, and second, that the party’s money would be best spent to influence races early. Though presidential turnout would favor them, Democrats started the cycle in a dark period. They hadn’t anticipated the depth of their losses in 2014, when Republicans took back the majority. Unexpected defeats of incumbents like Sens. Kay Hagan (N.C.) and Mark Udall (Colo.), two members popular among other Democratic senators, cast a pall over the caucus. Two-thirds of the remaining 46 conference members had never served in the minority, and relinquishing power hurt. Some of the younger members even considered making a change at the top by ousting their leader, Harry Reid (Nev.). Reid’s team heard those rumblings and successfully navigated around what could have been an ugly leadership fight. But both sides thought that the map favored the Democrats. Even beyond the traditional battleground states, Republicans saw worrisome signs that some of their members could face trouble. In October, more than a year before Election Day, One Nation, an outside group tied to the Crossroads network, began running advertisements touting Blunt’s work on behalf of military families. Trump was surging among Republican voters sick of the political establishment, and some worried that Blunt — a longtime Washington insider with a family full of lobbyists — could be vulnerable in a climate that favored outsiders. “You could see the vulnerability a long way away,” said Josh Holmes, a Republican strategist with close ties to McConnell. Together, One Nation and the Senate Leadership Fund, another Crossroads entity, had budgeted $4 million to protect Blunt, who defied some pundits’ predictions and kept his seat. President-elect Donald J. Trump’s transition operation plunged into disarray on Tuesday with the abrupt departure of Mike Rogers, who had handled national security matters, the second shake-up in less than a week on a team that has not yet begun to execute the daunting task of taking over the government. In a statement on Tuesday, Mr. Rogers, a former congressman from Michigan who led the House Intelligence Committee, said he was “proud of the team that we assembled at Trump for America to produce meaningful policy, personnel and agency action guidance on the complex national security challenges facing our great country.” And he said he was “pleased to hand off our work” to a new transition team led by Vice President-elect Mike Pence. In another sign of disarray, a transition official said on Tuesday that Mr. Trump had removed a second senior defense and foreign policy official from his transition team, Matthew Freedman, who runs a Washington consulting firm that advises foreign governments and companies seeking to do business with the United States government. Mr. Freedman, who had been in charge of coordinating Mr. Trump’s calls to world leaders after his election, is a former business associate of Paul Manafort, Mr. Trump’s former campaign manager, who once worked on the re-election bid of Ferdinand E. Marcos, the Filipino dictator ousted in the 1980s. Congressional Democrats, reeling from a huge setback at the polls, might ponder what their Republican friends when they were in the same situation eight years ago. "I campaigned on changing Washington and bottom-up politics. And I don't want to send a message to the American people that there are two sets of standards," Obama said on CNN, one of five networks that conducted previously scheduled interviews with the president Tuesday. "This was a mistake. I screwed up." Obama told ABC that it had been an embarrassing day. "We can't afford glitches, because right now what I should be spending time talking to you about is how we're going to put 3 to 4 million people back to work. And so this is a self-induced injury that I'm angry about, and we're going to make sure we get it fixed." Earlier Tuesday, former Sen. Tom Daschle withdrew his nomination to become secretary of health and human services, saying that his failure to pay what eventually became $146,000 in back taxes would prevent him from operating "with the full faith of Congress and the American people." Daschle told Obama of his decision in a telephone call. White House spokesman Robert Gibbs said the decision was Daschle's alone. There are at least three ways in which this very unconventional election was surprisingly conventional. First, the polls said that Clinton would win the popular vote. She did. 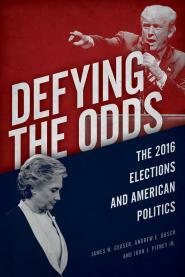 In March 2016, Michael Tesler, Lynn Vavreck and I drafted an article — subsequently published in August 2016 — in which we suggested that there were mixed signals in the American electorate. People’s views of the economy had recovered, although a variety of political assessments remained more pessimistic. Taken together, economic growth and presidential approval gave the Democrats only a modest chance of winning. If you factored in “time for a change,” the Republicans were favored. Other early forecasts by political scientists and economist Ray Fair showed the same thing. Vox took several such forecasts, asked two political scientists to average them, and came up with a narrow Republican victory in the national popular vote. Yesterday, the full roundup of these forecasts by Pollyvote said that Clinton would win the popular vote by 0.4 points. Currently, she has a 0.2 percent lead. She will probably exceed that, but the point stands: Those models said it was supposed to be close. Then, like most observers — including, apparently, the Trump campaign — I believed the forecasting consensus that Hillary Clinton would win and wrote as much yesterday. There were forecasts that gave Trump at least a reasonable shot, including the 24 percent chance given by the forecasters at our partner, Good Judgment. But I went with that consensus and, like others, thought Trump would underperform the average of the political science forecasts. So I was wrong too. Much will be written about why the polls in particular underestimated Trump’s vote share. It is all the more puzzling because serious attempts to measure the “hidden” Trump vote struggled to find much evidence of them. But for now, a striking fact is that the election ended up looking a lot like an average of the fundamentals-based models from several months ago. Third, Todd Eberly writes that the electoral vote displayed a surprising degree of continuity. ... I paired successive elections by comparing the Democratic share of the total vote by state to generate correlation coefficients. The state-by-state comparison generates a Pearson correlation coefficient with a low or negative value indicating a disruption or cleavage point and a higher positive value indicating continuity or electoral stability. Figure 1 presents the results. The changes taking place in the parties' coalitions in the late 1970s and early 1980s are evident as is the rather stable electoral period that emerged in 1996 - a period marked more narrow election victories and the emergence of the familiar Red and Blue states. 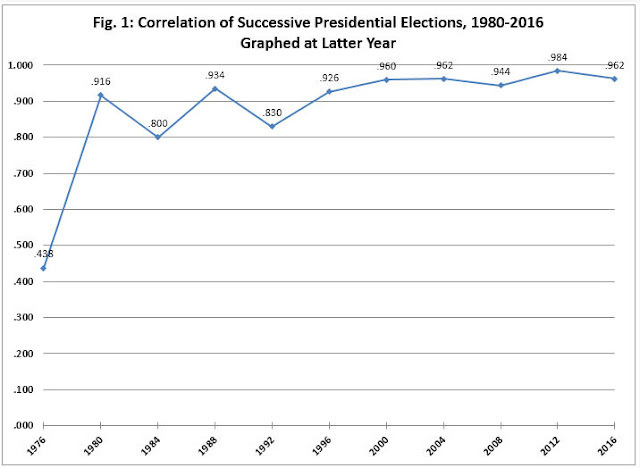 Donald Trump pieced together an impressive electoral coalition in the 2016 election, a coalition that included traditionally Democratic states like PA, MI, and WI - yet Figure 1 shows the 2016 election demonstrated a high degree of correlation with the election of 2012 – no fundamental changes took place in 2016. Rather Trump was able to achieve narrow victories in otherwise Democratic states. The results suggest that the present path to 270 electoral votes remains both stable and competitive. Republicans further cemented their control of state governments in this year’s elections. They will control the governor’s office and both chambers of the state legislature, a governing trifecta, in four more states — Iowa, Kentucky, Missouri and New Hampshire. The net effect of the elections Tuesday will be that Republicans will have a trifecta in 24 states, while Democrats will have just six, as of Friday. While Democrats picked up a trifecta in one state, they lost trifectas in two others. The losses are a harsh rebuke to President Obama’s call in October for Democrats to make gains in state legislatures when it appeared that Donald J. Trump’s campaign was stumbling. for a new heaven and a new earth, and they thanked us kindly and made their peace. Lobbyists are all over Donald Trump's transition team, according to an organization chart obtained by POLITICO that shows who's guiding the handover for various agencies. — Cindy Hayden of tobacco company Altria is in charge of HomelandSecurity. — Steve Hart, the chairman of Williams & Jensen, is in charge of Labor. His clients include Visa, theAmerican Council of Life Insurers, Anthem, Cheniere Energy, Coca-Cola, General Electric, HSBC, Pfixer, PhRMA and United Airlines. He worked at the Labor Department in the Pension Welfare Benefits Program and on the Office of Management and Budget's ERISA Reorganization Task Force under Ronald Reagan. President-elect George Bush, seeking to head off conflicts of interest that have plagued past transitions, will require extensive financial disclosure and a strict ethics pledge from every person who serves in his 73-day transition, the counsel for the transition said yesterday. In the campaign, Bush repeatedly answered criticism of the Reagan administration's ethical lapses by promising to establish stiff rules to prevent conflicts of interest in a Bush administration. He also has promised to impose tougher rules on lobbying once he assumes the presidency. For the first time, transition team members will be required to sign a five-part pledge as a condition of employment promising not to reveal or use inside information for private gain "at any time," according to the transition standards of conduct. C. Boyden Gray, transition counsel, said Bush will attempt to "contain the problem" primarily through appointments. "We are not going to appoint people to work in departments where they might come across information that would create conflicts," said Gray, the transition counsel. "An oil-and-gas person is not going to walk into the Energy Department." The polls were way off, so many forecasts -- including this one! -- were way off, too. But one prediction came true: Hillary Clinton won the national popular vote. Trouble is, the distribution was highly inefficient. She built up million-plus margins in New York and California, while running behind in the rest of the country.